Every year, thousands of buyers fly, drive and walk to the famous Tucson Gem Show in Arizona. The Tucson Gem Show is made up of 40+ different shows, and each one is at a different location in Tucson. 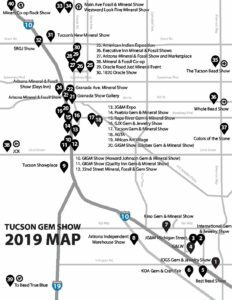 Use our special Tucson Gem Show map to find out which shows are near each other, and how to get to each show.